Warning You now need a permit from DLNR to enter this area. My lovely wife Barbara decided to bless me with her presence on today's hike and we planned to get up at 6:30am. When my alarm went off I found that she was up and reading eMail already. "The birds woke me up" was her reply to "what are you doing up already?" We ate breakfast, finished packing, got dressed an were out of the house by 7:30 or so. As usual on any hike morning was the required stop at 7-11 to buy lunch. After a stop in Nanakuli, to get some cheap gas ($1.42/gal) we were on the way to Nuuanu. The drive to town was uneventful, the weather wonderful on the Leeward Coast, and as we rounded Barbers Point we could see the Ko`olau Mountains capped in clouds, but the lower slopes looked fine. Arriving at 8:30, 1/2 hour early we found George and Matt there already talking to Susanna who has not been on a hike with us for about a year. 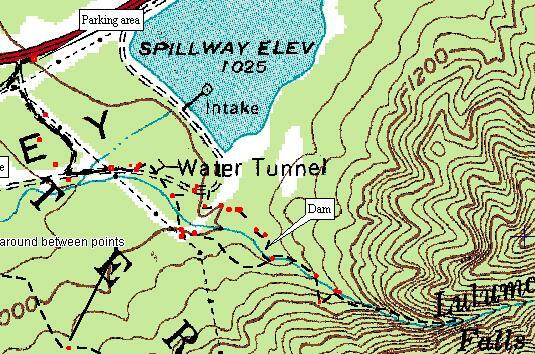 Below is a map of the starting location for the hike. Little by little the rest of the hikers arrived Karen and Ralph, Red and Karen, Ray and Debi, Landis and a bunch of Boy Scout leaders and members, and last but not least Francis. We began the hike about 9:10 am. The next map show the route we followed. Red dots are way point marks from my GPS which I took last Saturday checking out the route and marking it with yellow ribbons. The black dash line is the hike path to the falls.